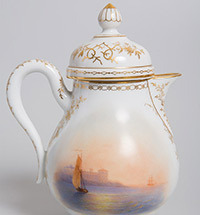 The images of Ivan Aivazovsky have been reproduced in many forms, none more remarkable than the tea service presented by Tsar Alexander II to his brother Grand Duke Konstantin Nikolayevich as a Christmas gift in 1861. Aivazovsky’s famous seascapes were copied in miniature with extraordinary skill in this testament to the lifelong close relationship between the artist and his royal patron. A recently-discovered family album belonging to Yelena Gayevskaya, wife of Feodosia town governor Pavel Gayevsky, sheds fascinating light on society in the town, and the interaction of its notable figures, in the first half of the 19th century. 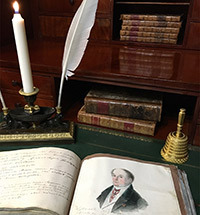 Containing remarkable early portrait sketches by Ivan Aivazovsky of some of those concerned, it reveals the broad and various historical links that extended through the beau-monde of the time - including connections which lead to the great Russian poet, Alexander Pushkin. The album affords invaluable context on the close-knit world in which the future great painter moved in his youth. At the beginning of autumn 1890, my grandfather, Alexander Vladimirovich Zhirkevich, a military attorney and a beginning writer, came to the resort town of Yalta for treatment. As was customary in those days, he stayed there for a while. 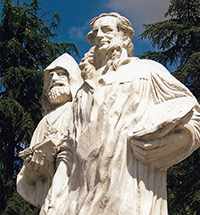 Treatment alone was not enough for his vivacious nature; he was curious to see various places of interest in the Crimea. He admired Ai-Petri Mountain, delighted in the sea views (“Will I see you again, charming land?”), and spent a day in Sevastopol. He would visit Sevastopol again soon, with his young wife Katya, who had come from Vilna to join him. By then he and Katya had been happily married for two years and they had a little son named Seryozha4, whom they lovingly called “Gulya” at home. 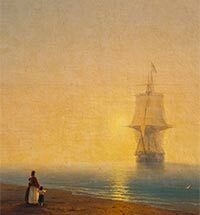 Aivazovsky was the key artist for the new generation of Russian collectors that emerged in the 1990s, whose work established new records for Russian art at auction. 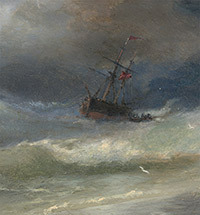 Ivan Samarine, who worked then in the newly-established Russian department at Sotheby’s, remembers a remarkable decade, as well as some key collectors from earlier generations, whose lasting enthusiasm for Aivazovsky ensured that the artist’s reputation remained constant on the international art scene. 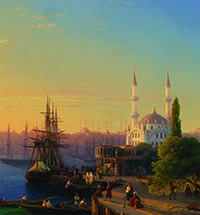 Samarine’s “Light, Water and Sky: The Paintings of Ivan Aivazovsky”, coauthored with Gianni Caffiero, will be published in a Russian version this year. 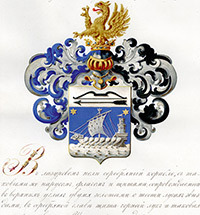 Ivan Aivazovsky, that most renowned artist, outstanding representative of the Russian academic school and internationally recognized seascape artist, has long been a symbol of prosperity, stability and investment wisdom for Russian society. 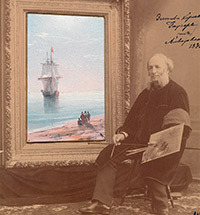 Alongside artworks by Isaak Levitan, Vasily Polenov, Ivan Shishkin and Konstantin Makovsky, the homes of certain “most prominent” representatives of the “Russian World” are often decorated with Aivazovsky’s paintings - as if they are an equivalent of the gold reserve or a signifier of strong faith in the stability of the government; a symbol of power, and an articulation of the conservative notion of the “imperishable”; an attribute of luxury, and a reminder of an enviable dowry or rich inheritance.